Hours of laughter for dog lovers. This beautifully illustrated best-in-show humor anthology includes quotes and articles from Dave Barry • Ellen DeGeneres • Jerry Seinfeld • The New Yorker • The Onion • Paula Poundstone • Steven Wright • Mark Twain • Jay Leno • David Letterman • Merrill Markoe • George Carlin • James Thurber • Rita Rudner • Bill Maher • Wanda Sykes • Erma Bombeck • Wendy Liebman • Jeff Foxworthy • Demetri Martin, and many more. Plus hilarious tweets from normal folks like you! Dave Barry will advise you on the best dog food for your dog (for starters, be sure you get “brown dog food”). Ellen DeGeneres tells you about her dogs’ intelligence (“I’m smarter than my dogs. Well, smarter than one of my dogs”). The Onion also offers valuable tips for training your dog (“Start with simple commands like ‘sit’ before working your way up to the more complicated ones like ‘fill the gaping void in my life'”). JO — A Must Read for Dog Lovers Everywhere And Everyone Else Too! I received this book as a gift and what a wonderful surprise. I have a three-year-old puppy and every page in this book was relatable. Funny, laugh-out-loud humor. A perfect coffee table peice for every home. It has worked in mine already. My mother and sisters have picked it up during visits and have become engrossed in reading it. A great gift. A great read. A great keep. Thanks to the authors for writing a light and easy, funny, talk about book. Super funny book. I liked the one about cats too. George Foster — Really top level humor. Totally enjoyable. Best humorists gathered together is a great concept. One gem after another. I don’t normally laugh out loud reading a book, but this is an exception. Thank you for putting this very funny book together. A keeper. Reading this now — Hilarious and so true. Prediction: all dog-friendly or dog-dominated Sapiens will love this. Stories, jokes, anecdotes and quips. All in the key of Arf. Genuinely funny collection! Ms. Secret — Perfect for coffee table…and other places you might sit and read for a while. We bought this for our kids as a Christmas present and as a way to bring levity to the daily chaos of owning two large dogs. Never would I imagine that each of us would read this book cover to cover–not only is each snippet hilarious, but the book is compiled in a way that you just can’t put it down. It’s like story-telling through bite-size bits of humor–just fantastic! Barry — Open to any page and find yourself laughing. I purchased this book along with its companion book focusing on cats. They are absolutely delightful. Weary of the generally nasty state of affairs in America? Pick up one of these charming books and open to any page. They provide welcome distraction from that nastiness. While not MANDATORY, I think owning a pet adds to the fun. I find myself saying “That’s my Benny” on just about every page. 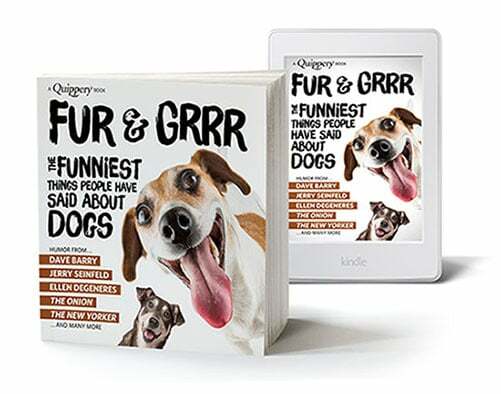 If you love your pet and you love to laugh, these books provide nearly endless enjoyment. Linda Egenes — A favorite book for every dog lover. I love this quote “The reason a dog has so many friends is that he wags his tail instead of his tongue.” Alternating between the wise and whimsical, this book captures the endearing, comical and loveable traits of man’s best friend. It’s the perfect gift for dog-lover friends. And if you don’t yet love a dog, you will after reading this book. Robert Edgeworth — Not the same old dog stuff. Better, much better. Well, and some classics too. A substantially large book, which I like, as I had to pay for it. It is a collection. You don’t have to start in the beginning and read to the end to be satisfied. You can find satisfaction on any page. Certainly a great gift, but it is a book I like having for myself. Within the confines of being dog related humor, the variety is vast. I don’t usually give 5 stars in reviews, but what’s not to like here.